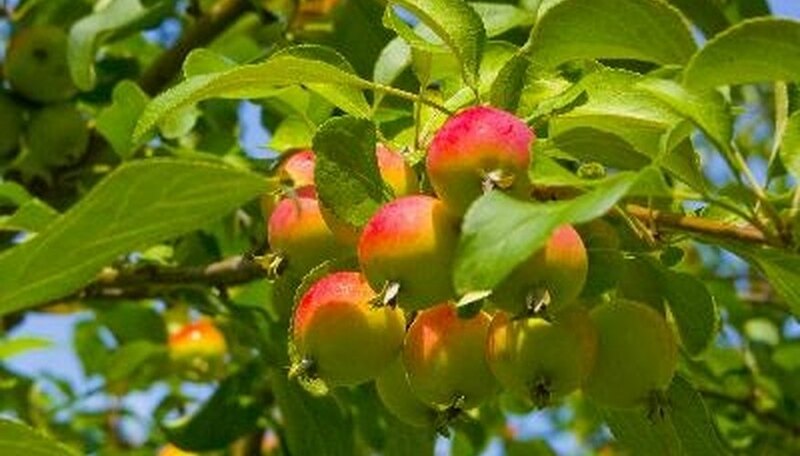 Most apple trees are not self-fruitful, so you must plant more than one cultivar in order to produce a crop of apples. For cross-pollination to occur between the flowers of two cultivars, the flowers of both trees must bloom at the same time. If one tree fades before the other blooms, neither will produce apples. Most apple trees will cross-pollinate with crabapple. Avoid using Winesap, Jonagold and Mutsu trees for pollinators because their pollen is sterile. Plant early blooming cultivars together for good cross-pollination. Idared and Liberty are two of the first to bud and flower. Red and Golden Delicious bloom at the same time, as do Gala, Jonafree and Honeycrisp. All of these apple varieties have firm, sweet flesh; Honeycrisp produces fruit the size of a softball. If you have a large orchard, the University of Missouri recommends planting one of these cultivars in every fourth row of another for best results. Braeburn, Pristine, York and Enterprise apple cultivars bloom in midseason. Plant two or more of these varieties together, no more than 20 feet apart, to ensure that bees, birds and air currents can transfer enough pollen from tree to tree. These cultivars produce medium-size fruit, with Braeburn being excellent for pies and applesauce. Goldrush, Rome and Granny Smith cultivars are among the late-blooming apple trees. Rome and Granny Smith are two of the "self-fruitful" varieties. They don't have to have another cultivar to ensure a fruit crop, but planting two cultivars will ensure a bigger harvest late in the growing season. All of these trees produce sweet-to-tart fruit, excellent for pies, sauces and salads. Most apple cultivars can be cross-pollinated by crabapple trees. Manchurian crabapple is ideal for the early-blooming cultivars listed above, while Snowdrift crab blooms in mid- to late season. If you don't have actual crabapple trees planted in the ground, the University of Missouri Extension suggests you hang buckets of water filled with fresh, blooming crabapple branches in the branches of the flowering apple tree you wish to pollinate. The bees won't know the difference and will carry pollen from the crabapple blossoms to the tree.